Last week my mom, my sister and her three boys headed down to visit and take care of my brother's family in Charlotte while my sister in law was out of town for a "roommate reunion" in Utah. I decided to surprise my sister with a bathroom renovation while she was gone. 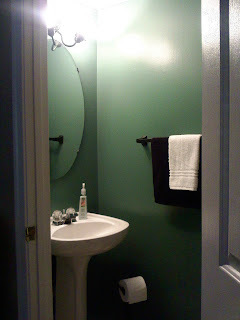 I did the whole bathroom for less than $60 (since most of my supplies are in storage - I could have done it for maybe $40 with my own supplies). I saved by refinishing existing furniture/fixtures and having Wal-Mart match the paint color Jodi liked. I love doing home renovations and I'm quite crafty. (Luckily for Adam, my big ideas never include him! :) There has never been a "honey do" list in our house. I do it all and love it!) 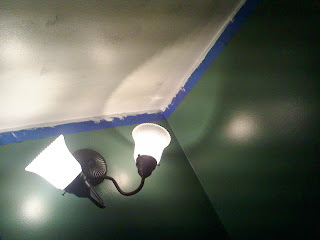 I'm pretty sure I will have an HGTV or DIY network deal in the works soon. The most impressive aspect of the remodel was not manueving in a small space with a growing belly, the vast change, the budget - OH NO - it was the sheer fact my mom was able to keep it a secret the whole trip! Sadly, I have no before pictures :( and the ones I did take are from my cell phone. Before, the walls were a pale yellow, decorated with the drawings of a 4 year old future Picasso. I am pretty proud of this light fixture. Prior to getting my hands on it, the metal was that shiny brass. My trusty textured black finish spray gave it an awesome wrought iron look. I am most proud of the glass bowls - I "frosted" them with this really cool spray I read about online and bought at Lowes. It really updated the fixture in less than 30 seconds. I am a BIG fan. My dad was a big help. 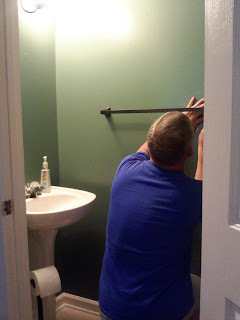 He took the toilet tank off for me, helped reinstall the fixtures to save time, bought me new and better paint supplies, etc. He's the expert painter in the family and my work met his standards - a big compliment. 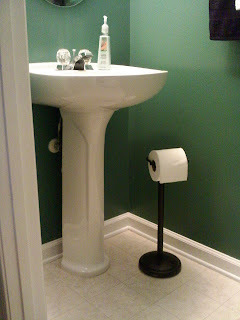 The toilet paper holder had long been destroyed in this bathroom by three boys. I patched up the wall and bought one of these fancy doo-hickies. The wrought iron one at the store was $5 more expensive - so we bought the brushed nickel and went at it with my trusty spray can. Eat that Wal-Mart. Additionally I painted the cabinet black, bought new nickel hardware and refinished some of the decorations to match the new wrought iron style. 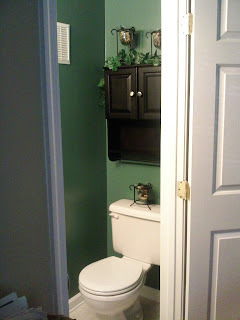 I also painted the quarter round to blend in with the trim and really make the contrast between the white and green pop. Anyway, it was a lot of fun and Jodi really deserved it. Most of all it made me realize that aside from the baby's room there will be no renovations in my house until after Autumn arrives. 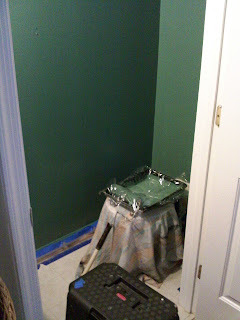 As much as I love refinishing and making over a room, it's a bazillion times harder pregnant! I just can't contort myself into corners the way I used to! It was a great surprise. I love it! 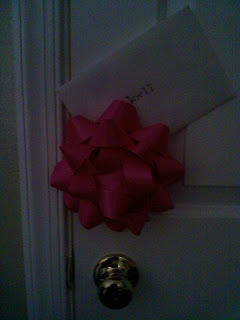 Anthony keeps opening the door and saying "See!" and pointing to the inside. They love it just as much. And I'm also totally shocked that Mom kept it a secret too. I know she was dying!